Things go better with KOKOMO!!! THE AVERAGE Whites broke the ice with their second album and Kokomo will be the first of the beneficiaries. To keep you interested, “Kokomo” is the best British debut in several years and I’d say we had another major group on our hands (except that “major group” is supposed to mean stuff like Led Zeppelin and Jethro Tull . . ah well). This ten-piece has been biding its time over recording and the rewards of the patience are obvious: A very tasteful sleeve, fine track programming, excellent production (Chris Thomas) – a quality of “finish” and a maturity rare in contemporary British rock. Yes, well – agreed. New standard of excellence are welcome any time, but what about the music? It sounds mildly sacrilegious, but Kokomo close this set with “Angel” and I prefer their version to Aretha’s. While you’re chewing it over, though, a couple of reservations. Kokomo, like most white musicians, tend to play a little faster than is really necessary and – whilst they actually slow down “Angel” to achieve their remarkably beautiful effects – most of the time I find myself wishing that they’d loosen up that little bit more and (as they used to say) lay back on the groove. Their version of Bobby Womack’s I Can Understand It, not withstanding the cumulative effect of its long crescendo, is just too speedy to be comfortable and, whether the acceleration of the original tempo is deliberate or not, the results lean too heavily towards white notions of dynamics and tension, forfeiting the physical/emotional harmony available to the more relaxed black approach. (Folks with variable speed decks might like to experiment with slowing this track a rev or two. The transformation from flying white to gliding black is almost sinisterly striking). And one more (small) reservation. Tony O’Malley, besides playing very powerful keyboards throughout, sings lead on four of the nine tracks – and I find his gruffness a shade coarse in the company of pure singers like Frank Collins, Dyan Birch and Paddie McHugh. Too much like a clean man trying to sound dirty, if you’ll permit a vagueness. Oh yes – and there is one substandard song: Neil Hubbard’s “Anytime”, which seems diffidently unable to decide what mood to commit itself too. But the rest is very fine indeed. 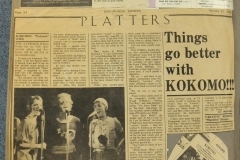 Frank Collins claims most of the composer’s credits and, though O’Malley’s “Feeling This Way” and Alan Spenner’s “I’m Sorry Babe” are no bar-room sing-alongs, his four numbers seem to define the aims of Kokomo as a band. “Kitty Sitting Pretty”, the opener, and “It Ain’t Cool (To Be Cool No More)”, the closer of Side One, both have massive “vertical” sounds – bass and keyboards holding the foundations, guitars meshing across the middle ground as trampoline for the lead vocals, and up on top the back-up vocals, constantly performing their own high-wire acrobatics. Very much the ideals of Arrival, in fact. “Sweet Sugar Thing” is the tricky time-signature number and the fast “horizontal” counterpart of the band’s more massive creation – whilst “Forever” is a luxurious ballad, probably the best original of the set. With so many participants, it’s impractical to catalogue every individual coup, so I’ll restrict myself to Dyan’s lead on “Forever”, Frank’s astonishing performance on “Sweet Sugar Thing”, and Mel Collin’s sax parts (particularly the harmonies) wherever they occur. I don’t even mind the Light Programme intro to “Feeling This Way”. Records as powerfully assured and as lovingly put together as this are criminally rare and it’s important to remember they even exist. Buy it and listen to it very, very loud. If you don’t, to borrow a phrase form Brian Case, you are wrong.